By W. H. Luyties, editor OWOE. With the election of Donald Trump as president of the US and control of all 3 branches of the government in the hands of Republicans, who have historically been strong supporters of fossil fuel interests, one lightning rod topic has been the push to increase coal and oil production in the US. This has energized both proponents of fossil fuels, who see an opportunity to possibly save their industries (coal) or increase production (petroleum), and opponents, who fear the environmental consequences of such a change. But is this a real threat to the global move away from fossil fuels, or is it simply rhetoric to energize a political base? In a series of blogs, I’m going to take a closer look into the key government actions to promote fossil fuels to assess how likely they are to achieve the administration’s stated goals. Let’s start with the attempt to revive the country’s coal industry. 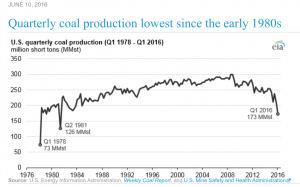 A central feature of the Trump platform for election was to reverse the dramatic declines in coal production and put coal miners back to work. In October 2017 Energy Secretary Rick Perry issued a Proposed Rule on Grid Reliability and Resilience Pricing that would effectively provide subsidies to coal fired power plants. Although the proposal was stated as a way to improve grid reliability, many viewed it as an attempt to preferentially compensate coal plants and make them more competitive. 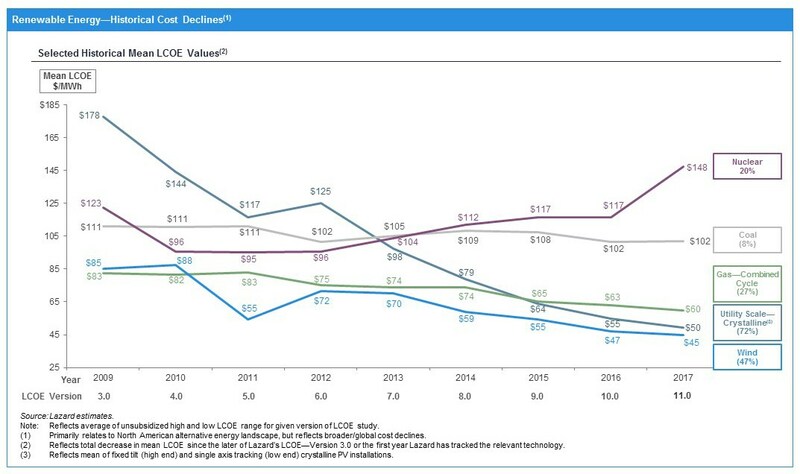 Without subsidies of some sort, the coal industry cannot compete with cheap natural gas (from shale gas developments) and rapidly decreasing wind and solar generated power costs. 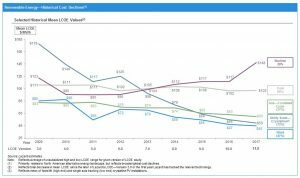 The figure from Lazard shows that the cost of electricity from a new gas, wind or solar power plant is less than half the cost of electricity from a new coal-fired power plant. In fact, in some parts of the country electricity can be produced less expensively by closing down operating coal-fired power plants and building new gas, wind or solar plants. That is a critical problem. The reality is that coal power is in a downward spiral. 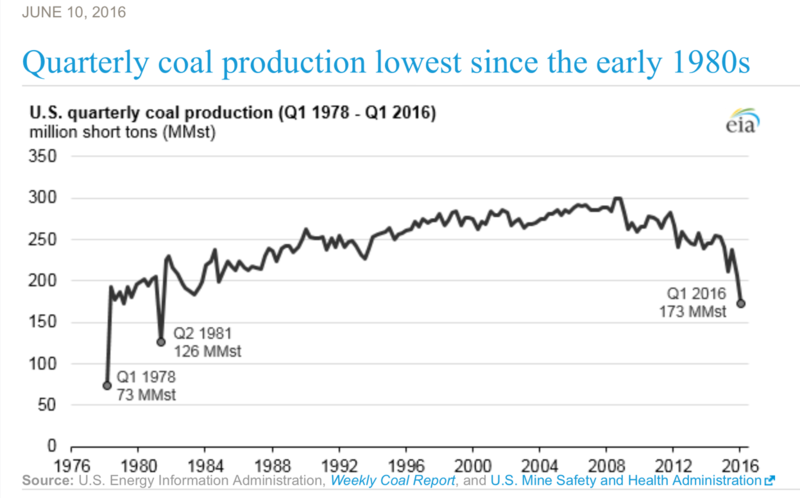 Coal production in the beginning of 2016 hit the lowest level it‘s been since a major strike in 1981, the current number of coal employees is the lowest on record since the US Energy Information Administration began collecting data in 1978, over two hundred coal units have shut down in recent years, and over half the coal produced in the US is from a company that has declared bankruptcy since 2012. As a poster child of the current coal industry problems, we can look at the Sandow 5 plant in central Texas, which I was responsible for building in my prior role with Luminant. When it became operational in 2009, it was one of the last new-build coal plants in the US and one of the most efficient and cleanest operating coal-fired power plants in the country. It was designed and built assuming a 20-year life, but with the expectation that it could likely operate for 30 to 40 years with proper maintenance. Luminant shut down operation of Sandow 5 in December 2017, a mere 8 years after start-up, claiming it was no longer economical to operate. If a plant of the likes of Sandow 5 can’t compete, how can the older and less efficient plants survive? For a while, the coal industry looked to exports as a way to maintain production. Many third world countries were dependent on new coal plants to produce the electricity needed to fuel their economic growth. At one point in the late 2000’s China was starting operation of a new coal plant every week. However, a combination of a slowdown in economic growth and increased investment in renewable energy has changed that picture. Growth in coal power in China, India and other countries has slowed, and in the last year China has cancelled plans for 132 new coal plants.